Designed for individual protection, a new rapidly deployable ‘Emergency Body Armour™’ is offering the latest in globally respected and field-tested body armour technology, displaying truly outstanding protection from edged weapon, such as machetes and knives. Following a number of well documented knife attacks on civilians in recent years, PPSS Group started a comprehensive R&D project with the aim to design a ultra-lightweight body armour that can be strategically located in public places and deployed within a very few seconds, in case of emergency. 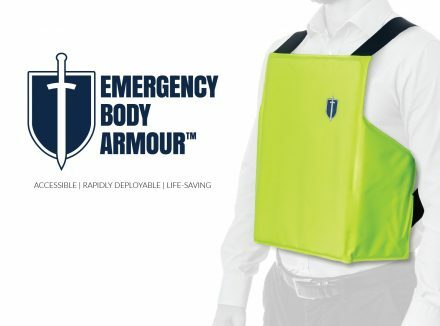 The UK firm is now making this new ‘Emergency Body Armour’ available to airports, train stations, hospitals, city centre hotels, and other key locations civilians may flee to and seek shelter when faced by a suddenly occurring threat. According to the company behind this concept, this latest ‘Emergency Body Armour’ also offers unmatched protection from blunt force trauma injuries, usually suffered following an assault by a blunt object. Following the issuing of body armour to all Police Forces in the UK in the 90s, many hospital and university security teams have now equipped their teams with stab resistant vests since. The same can be said for several public sector enforcement teams, such as Trading Standards, Licensing, Community Safety, Environmental Health and Car Parking Enforcement. PPSS Group is specialised in the development, manufacturing and supply of high performance body armour, offering unrivalled protection from firearms, edged weapons and blunt force trauma. PPSS Group’s social media presence: Facebook, LinkedIn, Twitter, Google+ and Instagram. This entry was posted on Friday, September 8th, 2017 at 00:43	and is filed under Armor, Press Release. You can follow any responses to this entry through the RSS 2.0 feed. Both comments and pings are currently closed.